Safety Turtle 2.0 Pool Alarm is the new version of the original Safety Turtle. The perfect way to know if your pet is in the pool! Even if pets can swim, they often have trouble finding the steps to get out. 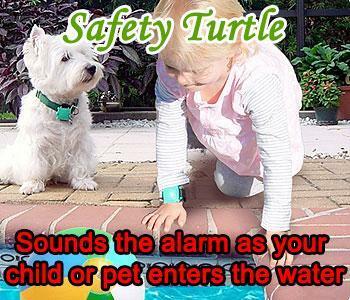 The Safety Turtle 2.0 pet kits includes the Safety Turtle 2.0 pool alarm base, always watching the pool, a Safety Turtle 2.0 Turtle on a velcro strap for the collar, USB cord and wall adapter. You can add as many pet adapters or child wristbands to a system as needed. If your pet enters the water the Safety Turtle 2.0 Pool Alarm base will alarm. 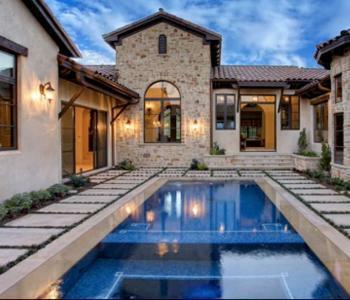 Better than a pool alarm because it's always working and no size or weight limitations. One year warranty from purchase date. Not compatible with older Safety Turtle models. The Safety Turtle 2.0 Pool Alarm Pet Kit is exactly the same as the Child kit except the Turtle is on a velcro strap (not a locking wristband). The Safety Turtle 2.0 will trigger an alarm at the base if your pet enters the pool. Works in all pools and can accommodate as many Turtles as needed. Better than a pool alarm because its always working. No pet size or weight limitations.